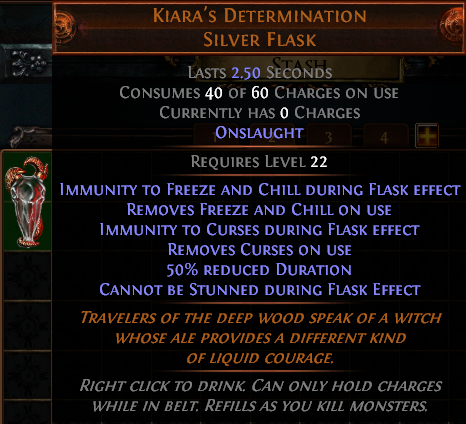 Kiara's Determination - a new unique flask coming in 2.3.0! I'm excited to share with you one new unique coming in 2.3.0! I designed this unique with the help of Nick over the past ~6 months. The original idea for this item was to rain a few seconds of totally uninterruptable, unstoppable wrath down upon your opponents. Partially inspired by the Juggernaut's "Unstoppable" node, this flask makes your character immune to most things that would interrupt your ability to DPS, as well as granting you Onslaught for that extra boost. Although this was initially inspired by offense, it provides a powerful defensive tool and a lot of utility, effectively relieving you of the need for "of Heat" and "of Warding" flasks. The stun immunity is particularly useful for Chaos Inoculation users, allowing them to give up the Eye of Chayula for other amulet options, at the cost of less-than-100% uptime on the stun immunity. The low base duration (3.5 seconds with 20% quality) means you'll have to use its charges wisely. I'd recommend popping this flask before you head into a fight with a dangerous foe. Designer of Kiara's Determination and The Lover Divination card. Cost is steep enough that not everyone would use it, but I could see CI wanting the stun and freeze immunity. The curse immunity is a very nice bonus, too. Pathfinder in particular can extend that duration probably enough to be useful constantly. Amazing flask! I like that it's really focused in what it does and provides a lot of utility. It's extremely good with CI, but most builds could probably take advantage of it. Should be able to get near-permanent uptime on it with Pathfinder as well. Always nice to have some fluff with the buff. What's this? A well-balanced unique? Wonders will never cease. LOVE the new flask. I deffinately think it's a well designed and balanced flask, along with the theme easily portayed in it. Awesome Job!! Edit: I think the flask id's very strong, b.s. will be essential for some builds, however the short 3.5 sec duration makes it to where it's not so strong that every build wanna to use it. I'm hoping this will be a third tier unique, 4th tier being the highest. Also, could we get a like gold ggg person to comment on this like Chris or someone to draw more attention? Sure, the lab can be hard, but it's pretty easy if you're properly geared, and not terrible at the game.